Media Unlimited director Magda Abu-Fadil served as a jury member for the investigative journalism category of the Arab Journalism Award (AJA) in 2018 in a bid to raise the standard of that media field. The Award ceremony [AJA Supplement in Al Bayan-18-2018-04-05] usually comes at the end of the Arab Media Forum (AMF) in Dubai every year with prizes for different categories handed out to reporters, editors, columnists, photojournalists and cartoonists from across the Arab world. Abu-Fadil is a former AJA board member and has been on several of its juries over the years. This year experts closely scrutinized media’s fierce competition and misleading information that causes harm at the AMF [AMF-A5 Agenda_Website_En] in April amid clamor to rectify wrongs. “Credibility tops the agenda,” [أجندة منتدى الإعلام العربي 2018] said Mona Al Marri, the DPC president who heads the Forum’s organizing committee. 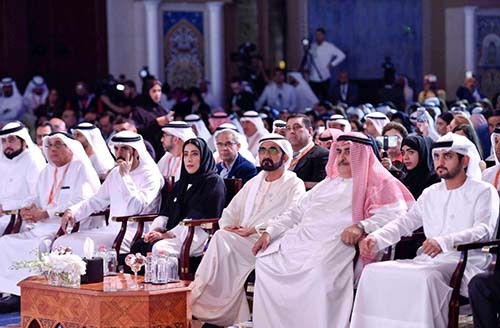 Over 2,000 Arab and foreign media professionals, academics and corporate leaders participated in the 17th edition of the Forum organized by the DPC. Innovation and technology also took center stage at the two-day event that packed a rich and forceful program that also focused on errant media and the negative impact of social media.